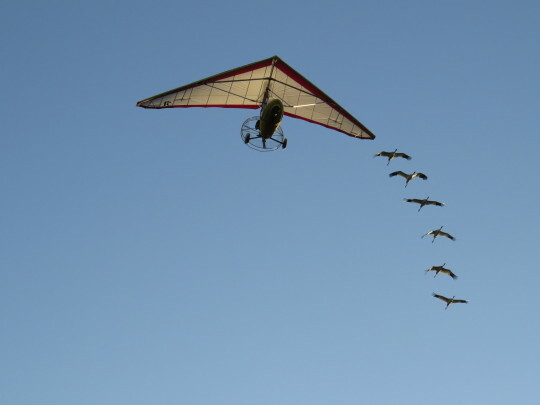 Operation Migration is known for the iconic photo of young Whooping Cranes flying in formation behind an ultralight aircraft. 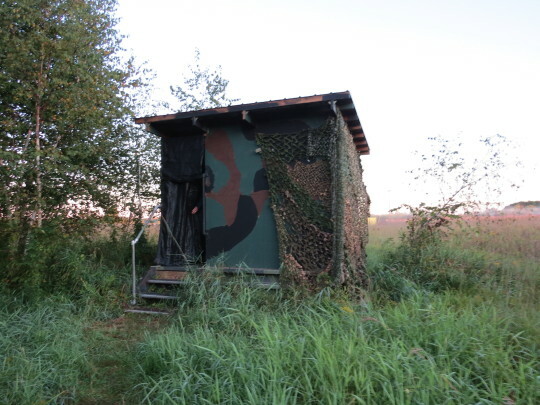 Most people we have spoken to about OM said, “Oh yeah, like Fly Away Home!” And yes, the film Fly Away Home is based on the work done by Bill Lishman and Joe Duff who are the co-founders of Operation Migration…but the reality of OM is so much more. Let’s begin with a quick overview of the equipment. 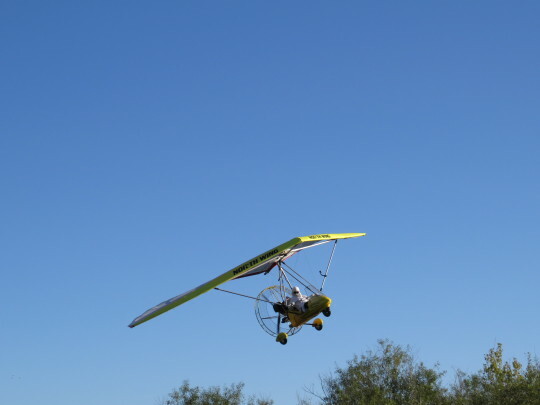 The ultralight aircraft, known in OM lingo as the “trike”, is a Special Light Sport Aircraft (more background here for airplane enthusiasts). OM has flown with a few different aircraft over the years and they continue to make modifications to make their trips more effective and efficient. One of the hoped-for improvements is to use a clear material on the wings to more easily keep track of the birds while in flight. Then there are the costumes, known as “Tumes” in OM lingo. 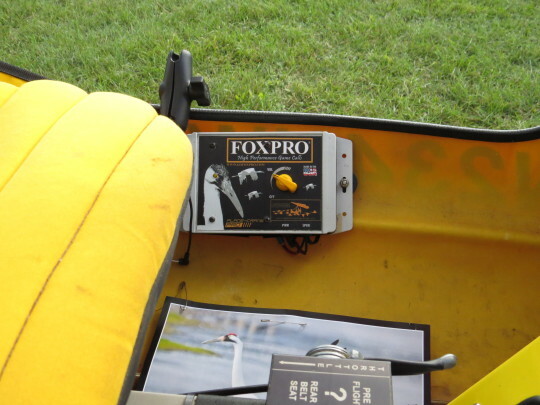 They are an essential part of rearing the young chicks. In order to prevent the birds from imprinting on humans, any time an OM staffer interacts with the chicks, they are silent and in a Tume. The Tumes have also evolved over time. 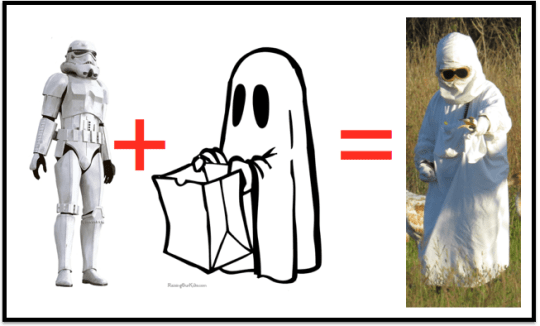 The most recent ones look like a cross of a Storm Trooper with an old-school Halloween ghost. Luckily none of the birds have seen Star Wars or ghosts so they aren’t taken aback. In order to simulate the experience of being raised by another Whooper, the Tumes also include a strikingly realistic adult Whooper head and hinged mouth. These “puppets” are used to give food such as grapes to the young Whoopers and to teach them to forage on their own via mimicry. 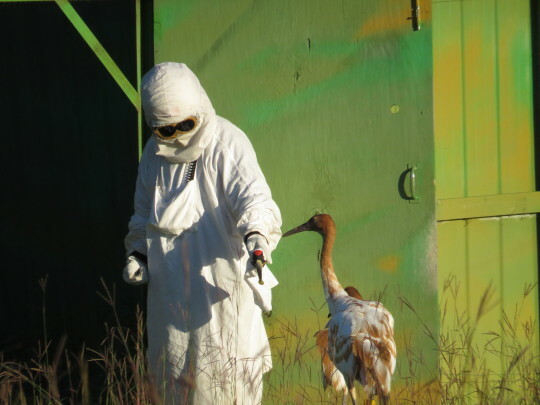 Until there are enough Whoopers to ensure proper genetic variability and a large enough population to be self-sustaining, the Whooping Crane eggs are laid at captive breeding locations. 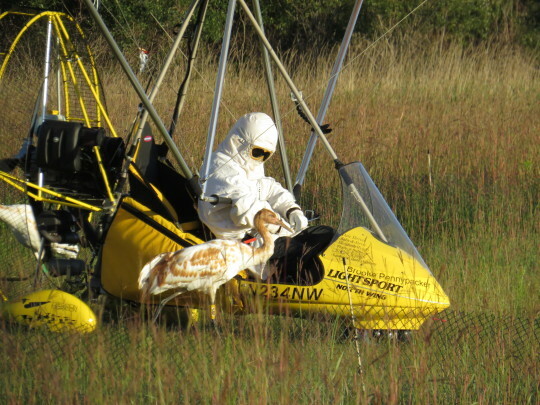 They are brought to the U.S. Geological Survey’s Patuxent Wildlife Research Center in Laurel, Maryland. 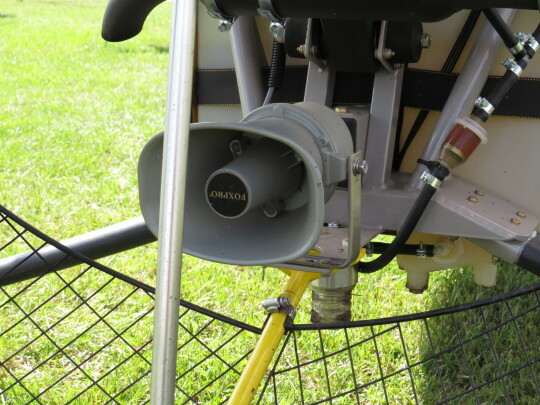 Now, the goal is to rear them so that they’re used to hearing the engine of the ultralight and interacting with the Tumes. 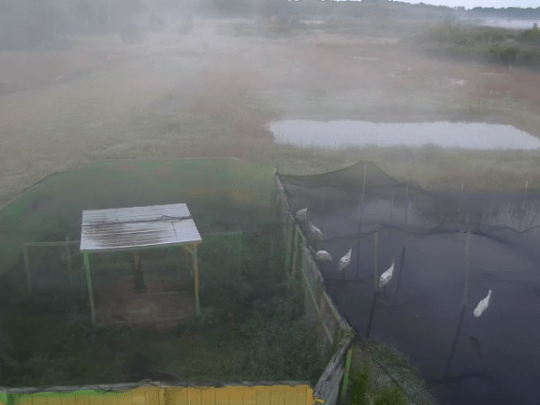 Before the eggs are hatched, and just after, aircraft engine sounds and the brood call are played near them. This is taking that Mozart for Mothers To Be thing to a whole new level. 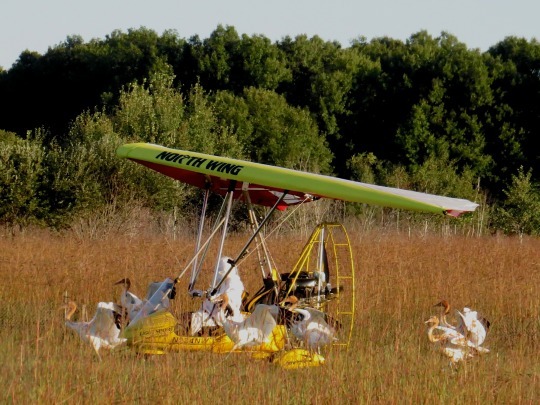 As laid out in their detailed protocol, the young chicks are slowly introduced to the aircraft. First, it has no wings and doesn’t move, then it moves, then the wings are added, etc. Bit by bit, the chicks adjust to their avian foster mother and the silent Tumes. 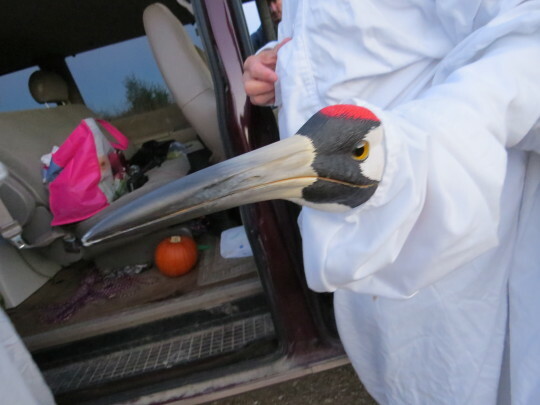 Before they can fly, the birds are then transferred to their next temporary home at White River Marsh Wildlife Area to begin flight training. They are housed in an enclosure that includes a dry pen and a wet pen. Again, they are given time to slowly adjust to their new habitat and to the trike. 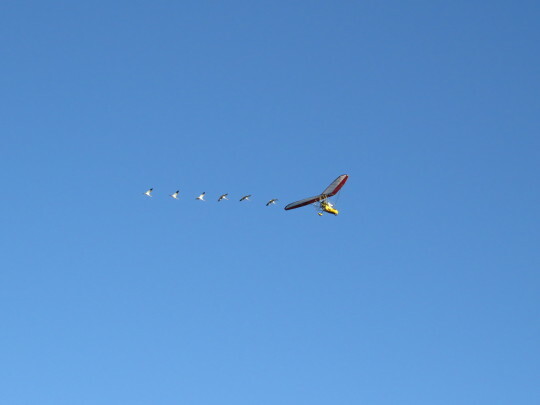 The Whooping Crane Festival was full of fun activities but our favorite, by far, was watching the flight training. Every morning of the festival (and every day until migration, weather permitting! ), a group gathers at the Flyover Viewing location to ‘ooh’ and ‘aaah’ in unison (while some turn into waterworks, more on that later). We highly encourage you to check this handy list of public flyover locations and see a flight for yourself, it’s quite moving. 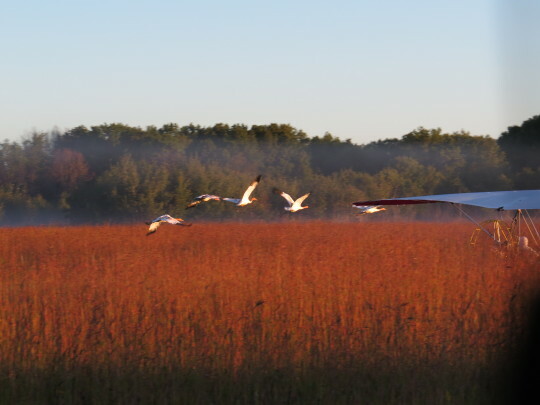 …from which silent, non-Tumed viewers can watch the Whoopers and ultralight take off and land. At the festival Dinner we had the pleasure of sharing a table with some wonderful people, including Ann Gillis who generously gave up her spot to go the blind so we could have the opportunity. This was a highlight for us and a kindness that we will not soon forget. We met the Tume-wearers for that day: Doug, John, and Colleen. They were far more chipper than we were at $%@& in the morning. 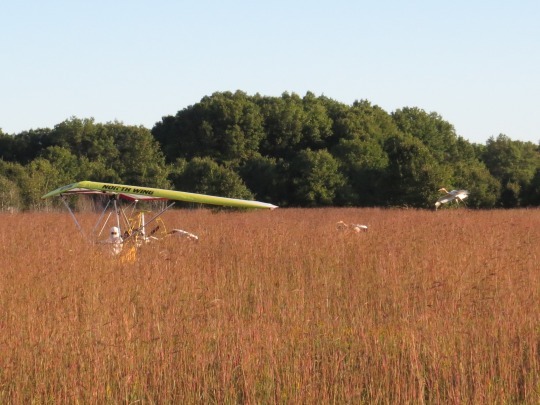 …and when Joe, the CEO/pilot, gave the ready signal, then Doug and Colleen opened the gates and the birds literally ran directly into take-off. The trike had to get moving to keep up! And remember we mentioned waterworks? Well, that sight alone had one of us spouting enough tears to save California from its drought. It actually earned her the nickname, “The Blind Baller” which is not too shabby as nicknames go. It really was such a beautiful moment. 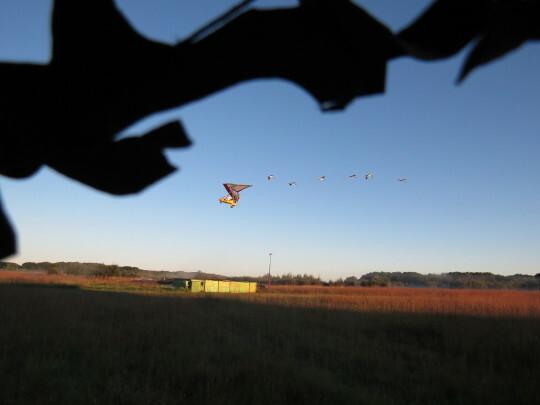 …with Joe providing regular updates about their speed, altitude, and what the cranes were up to: sometimes trying to overtake the aircraft and sometimes flying in a perfect line behind the wing. Eventually, the whole cohort landed and the Blind Baller slowly flooded White River Marsh. Then, Joe, Doug, and Colleen spent some time with the birds, giving them grapes via puppet to reward them for a wonderful flight. It’s hard to put into words what made this whole experience so wonderful. 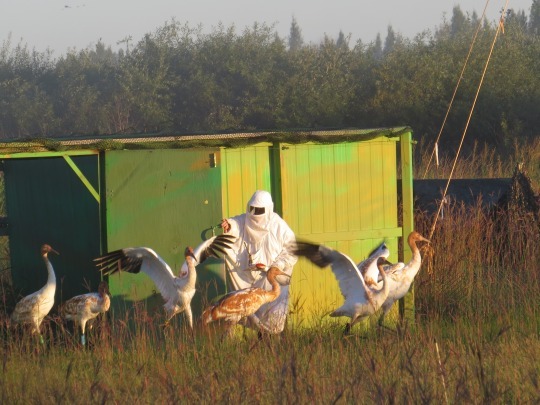 The Whooping Cranes themselves are majestic. 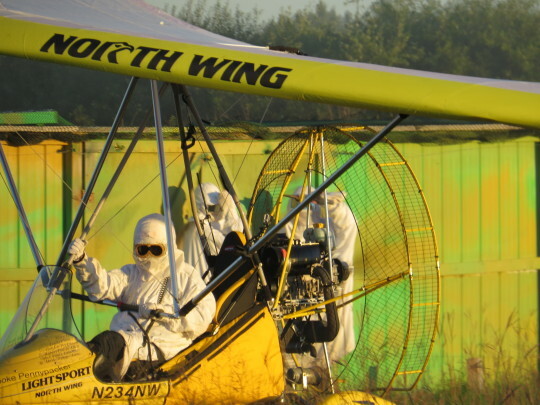 The way they learn to trust and interact with these silent, Tumed humans and a whooping Ultralight aircraft is magical. 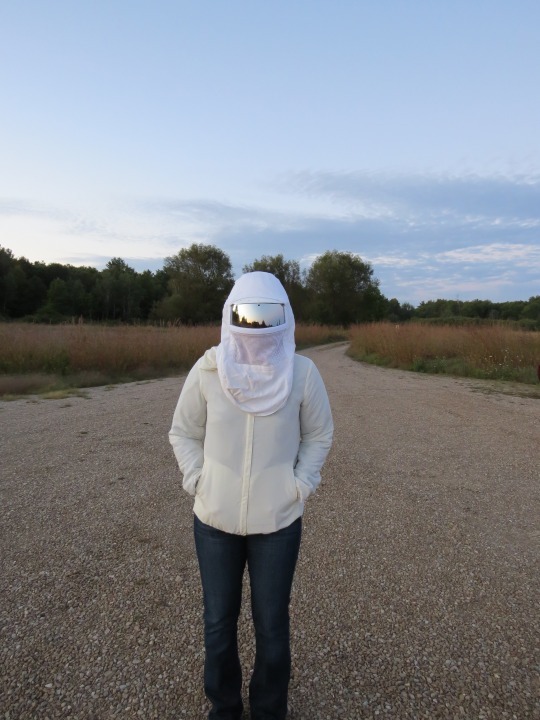 But what we didn’t expect was how blown away we were by the people working to bring Whooping Cranes back from the brink. Every single OM employee wears many hats and pitches in wherever they’re needed (the stories we heard could fill a book!). And then there are the volunteer Craniacs such as the 2015 Volunteer-of-the-Year Mary, who makes every Tume by hand, modifying it for each person’s needs (she should be very proud that the costumes are now on display at Disney’s Animal Kingdom and the Smithsonian Air and Space Museum). Their tenacity, their passion, and their ability to continue their work tirelessly every single day – to battle any and all obstacles (both man-made and natural) – to do what any rational, thinking person would have said couldn’t be done… They work so hard literally saving an entire species (and all of us) one bird at a time and they do it with gusto, creativity, and a strong sense of purpose. A lot of people talk about making an impact, making positive change on our planet but these people embody it. And the best part is…we can all help! 1. 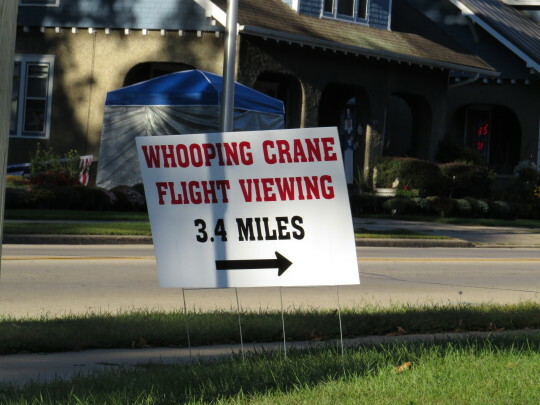 Give a Whoop to support crane conservation. 2. Become a Mile Maker to support this year’s migration. As of this writing, they are at 575/1200 miles..almost halfway there!